As one of the most famous women in the world, it's inevitable that Catherine, the Duchess of Cambridge, is going to draw a huge amount of attention wherever she goes. But after seven years as a member of the royal family, and even longer in the glare of the media, it seems Catherine is now pretty well practised at avoiding huge amounts of unnecessary attention. In fact, the Duchess has a very subtle trick which she deploys in order not to draw attention onto herself, and away from the bride, when she attends weddings – a pretty sweet thing to do given the reality of the focus that’s usually on her. When the Duchess heads to the nupitals of her friends and family, People magazine noticed that she has a tendency to re-wear outfits she’s been seen in before. It’s a clever move, given that whenever she wears something new, fans clamour to discover which designer it’s by and where they can get it. But by choosing an outfit she’s already worn, she effectively leaves her fans and the world little more to discuss. It also allows the bride’s special wedding dress to take centre stage on her big day. Interestingly, the Duchess of Cambridge also seems to only ever wear very neutral colours to weddings. Most recently, she attended the wedding of her very close friend, Sophie Carter. For the big day, Catherine chose to wear a recycled blue Catherine Walker coat dress which she’d worn many times before, on royal engagements. 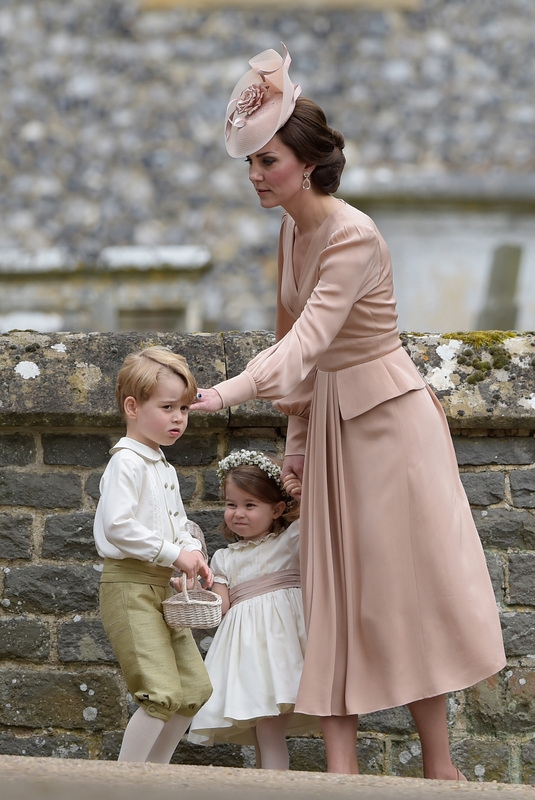 The blue of the outfit blended in perfectly with the colour scheme her children, George and Charlotte, were wearing, as a page boy and a bridesmaid. Back in May, at the wedding of Meghan Markle and Prince Harry, the Duchess of Cambridge also used a similar trick to ensure all attention would be on the bride. She wore a stunning, but neutral, cream coat dress – an outfit that, again, she’s worn many times before. At her sister Pippa’s wedding, she also opted for a gorgeous, blush pink dress that, while utterly elegant, was subtle enough to allow her little sister to shine on her big day. And it’s a pattern that the Duchess of Cambridge has repeated throughout the years. At the wedding of Zara Phillips and Mike Tindall, in 2011, she wore a simple cream outfit – again, allowing Zara and her stunning dress to take centre stage. It seems that Catherine’s new sister-in-law, Meghan, has also decided to take a similar tack when attending her very first society weddings this summer too. At the recent nupitals of Harry’s best friend, Charlie Van Straubenzee, the Duchess of Sussex opted for a stylish but subtle black outfit, with only a hint of colour in the pink and green pleated skirt. She and the Duke of Sussex also took further steps not to upstage the bride, Daisy Jenks, at the end of the ceremony, by zooming out of the church and away in a car before the new bride and groom emerged themselves.